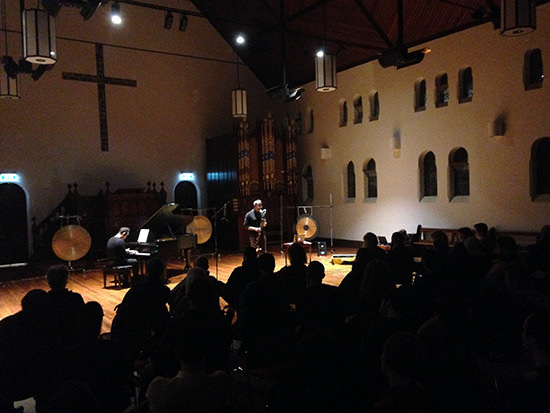 Alexander Garsden walks quietly behind a wide arc of four large gongs, each suspended in front of a transducer mike affixed to their rear faces. He adjusts things slightly as his mixer channels their sympathetic frequencies. Messages To Erich I & II (2015-6) is the opening piece for this evening of membranous sonic events. You can call it music if you want. I certainly do. The resonant riches of gongs have long been appreciated both within and outside the academy as an aural portal into the dense verticality of tone (over, sub, upper, hyper, psycho etc). The ringing gong, cymbal or bell—each notably circumscribed by celestial circularity—is like Narcissus’ pool in terms of its attractiveness. Yet unlike narcissistic drive, listening to these enriching tones has long granted listeners consciousness of the fathomless depth of the sonic. Their distinctive harmonic drone and its transmogrification from one pitch constellation to a range of shared resonating shapes holds the power to extinguish human centricity. The Inland concert series is clearly committed to this appreciation of the sono-musical excitation of sound. Garsden’s piece is a perfect hors-d’oeuvre for the evening’s tacit remit: to foreground the experiential through compositional, performative and improvisational strategies. True to the surfeit of sensation which inevitably arises from this approach to welcoming sound as extant rather than extracted, my mind cruised through a semiotic pathway, recalling how the histories of analogue and digital synthesis pursued sympathetic resonance as an enlightened plateau which returned artificial electronics to naturalised sonics. Some moments of Messages sounded wholly electronic. A counterpoint to this piece was Rohan Drape’s sumptuous dive into the microtonal mist unleashed by live processing of his digital keyboard. He mimicked grand organ tones in order to transform them into dense clouds of partials and harmonic transitions of originating diatonic notes. Titled which, unlike the heliotrope, turn timidly away from the sun (2016), the work, performed in darkness, commenced and finished like an hallucinated interruption to the evening. It presented more than an exploratory excursion down the well-worn safety-roped pathways of alt tunings. The listening experience hinged on the simultaneity of conflicting tunings, granting the slippery ear both an indoctrinated framework and its programmatic alteration. This powered the piece beyond pure sonic sensation. If Drape’s piece hovered at the membranous aural periphery between the diatonic and the microtonic, Jim Denley’s masterful improvisation actualised and physicalised this epidermis. 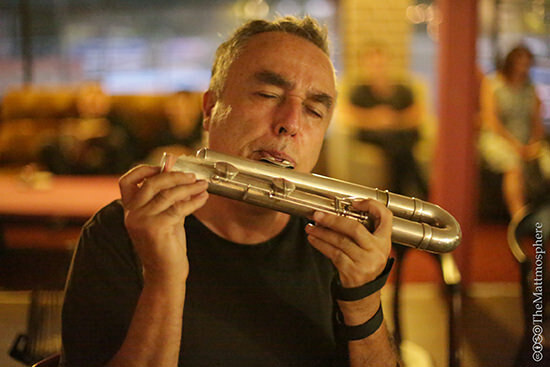 Performing on a bass flute modified with a thin membrane affixed to its end, Denley deftly shifted the instrument to his right so that the membrane touched three thin rods spinning furiously, courtesy of a modified power tool. We should all by now know of the predictable sonic occurrences of these devices rigged this way, but in the hands of some performers and their configurations, the result remains transfixing. Denley’s performance circumnavigates this critical shortcoming which I feel plagues so much exploratory music. How? By exciting possible semantic tangents. His rhythms grounded the improvisation, as he articulated both the determinants of his physicality (height, posture, arm-reach, breathing cycle) as well as their transcendence (shifting body weight, circular breathing, proximity sensitivity). Once he turned on the power tool and commenced breathing, the effect was like a Rube Goldberg event predicated on causal balance. The aural result was a series of passages which formed envelopes of sound, each carrying miniature algorithms of his performative situation and moment. Listening to the tubular flanging of the vibrating membrane and its frenetic aural speckling resembling spectral equalisation, I was reminded of urinating into a stainless steel toilet—sadly a pleasure disappearing from our contemporary soundscape. This is no mere vulgar assertion on my part: an enriching sonic experience in concert can propel the listener into the most unexpected locations and moments. If sound is to be truly regarded as something greater than the listener, this is where the open ear can end up. Threaded through the evening’s pieces was a suite of interactions between Anthony Pateras on piano and Anthony Burr on bass clarinet and sine waves. Two compositions by Burr presented his rigorous articulation of how breathing, listening, intoning and toning can generate a choral dialectic for a composer-performer of his calibre. A fixed tonal chord of maybe two or even three sine tones droned from his laptop. Now, we have heard sine wave tones many times before. I wrote a potted history of the sine wave tone last year as a chapter in the book Abstract Video Art (University of California Press), so it’s hard to make small comment about it. Burr’s pieces—Life seen by life (2016) and Word And Also Its Echo (2016)—made me think of many things. The first is the weird occurrence of hearing sine waves in a church. Who would have thought such a sonic thing would ever happen? Yet this very juncture between the ‘acousacred’ and the ‘sinospritual’ frames the semiotic substantia of how experimental music thankfully will always exist beyond prescription. Second, the uniqueness of experiencing these sine waves. Treated as orthodoxy, Burr’s compositions are inevitably aligned with the activated listening required by and for Alvin Lucier’s excitable frequencies and Pauline Oliveros’ excited spaces. But how dull to attach an exciting performance such as this to the historicist template of what now is a modus operandi of over a half-century’s standing. Burr’s compositions granted a specific experience which—true to the Eastern perceptual philosophies which shaped certain early experimental practices—were more about the space between events rather than the events themselves. Even that reduces the sensation of the performance. I was amazed by my doubting the sine tones’ fixity each time Burr stopped his channelled breaths and tense embouchure. Was the pitch higher now, or lower, or constant? The greatest depth of any sound lies in one doubting its presence, its identity, its characteristics. For when one doubts while listening, one knows that sound is greater than can ever be heard. Burr’s sonically invisible tones—countered by Pateras’ measured interjections of data-sets summarising the harmonic interaction between Burr’s notes and the sine wave tone—guided the audience around the sine wave tone. It was like being taken for a walk around a superstructure which patiently invited close inspection of its form and surface. These compositional techniques informed the evening’s concluding improvisation, The Long Exhale (2014-16), which re-interpreted moments from the tracks on the gorgeous Immediata CD of the same name released this year. As Pateras and Burr sounded their final lingering tones, the membranous returned to its infinite equilibrium, like the aerated skin of water in a glass. The Inland concert series evidences a wealth of talent dedicated not merely to being ‘transgressive’ or ‘avant-garde’ (terms as radical as Bruce Willis singing the blues), but to quietly conducting contemplative research and presenting fascinating results. Sound by nature, but music by name.